A prototype build of AT&T's upcoming HTC One X was recently sold on eBay. An xda-developers forum member named "voteccow" got wind of the listing and quickly purchased the unreleased smartphone before it was pulled from the online auction site. Not to be confused with the HTC One X from across the pond, which carries NVIDIA's quad-core Tegra 3 processor, AT&T"s model is instead powered by Qualcomm's dual-core Qualcomm S4 Snapdragon. 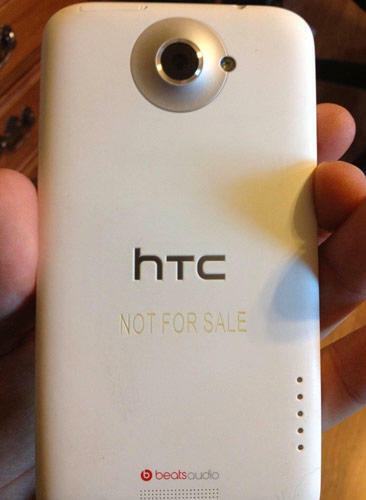 The buyer posted pictures of the device online, including one that clearly shows the back of the phone branded with the words "Not For Sale." There's no word yet if HTC or AT&T will take any legal action against those involved in the selling or purchase of this device but, as history reveals, companies tend to frown upon this sort of thing. The early access to AT&T's HTC One X— specifically by a member of a community known for tweaking devices — will likely give eager developers an early jump on creating custom software for the device. Recent rumors suggest AT&T may begin selling the One X in May.